Looking for Christmas lights near you & other Christmas light displays around Kansas City? We’ve got your Holiday Lights Guide! Find tree lighting ceremonies, light displays & light shows to create your own Christmas light trail around town. Where to Find Christmas Lights Near Me in 2018? We teamed up to bring you all the details on the beautiful Christmas lights in Kansas City for your family can enjoy. We’re crowd sourcing…and we need YOUR HELP! to find the best and the brightest displays around town. If someone sends us a spot to add to the list, we’ll do it. However, some holiday lights that people find worth the drive, might not please others. Keep in mind, we can’t drive to each of the 66+ Christmas light displays to verify the holiday lights are on. Most Christmas light displays are also outdoors. Please, understand this as you head out. Also, drive safe with your families. Always check the weather before heading out. **Spots with a double asterisk are verified locations. 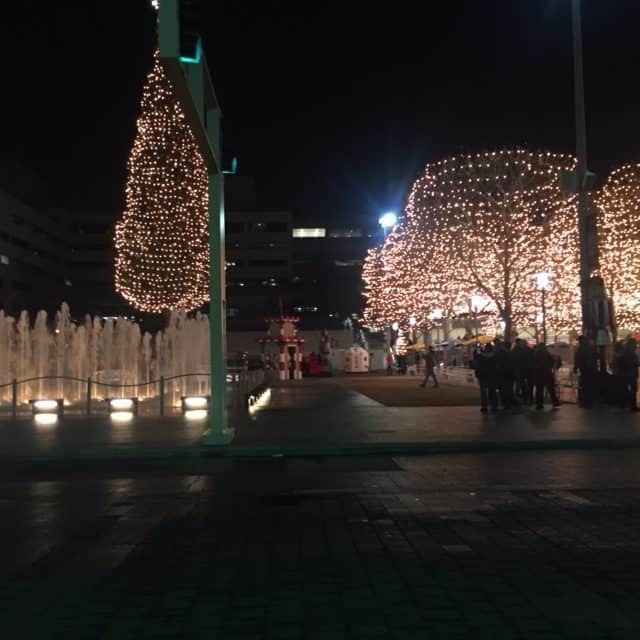 These Christmas light display have been visited by an iFamilyKC team member or friend of an iFamilyKC team member this year. Holiday light locations with no asterisk have not been verified this year but have previously had light displays. If you’ve been to one of these spots, let us know in the comments to keep the 2018 Christmas Lights List updated! As you leave your home to enjoy the lights, please also consider your pet’s safety during the holidays. 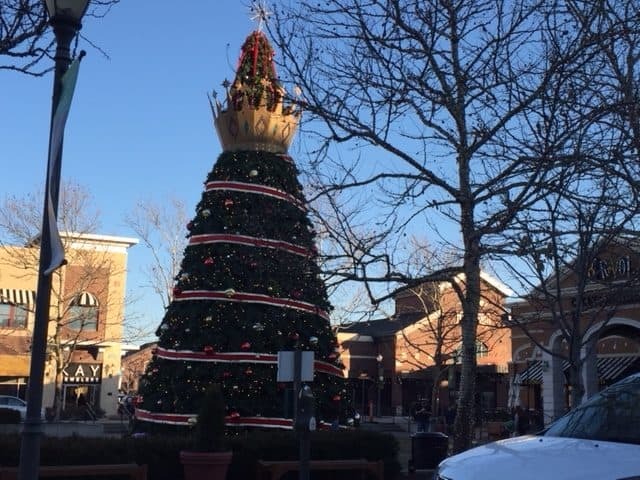 Legends Outlets near the Kansas Motor Speedway and Sporting Kansas City offers a fabulous 45-foot tree that features lights synchronized to holiday music. 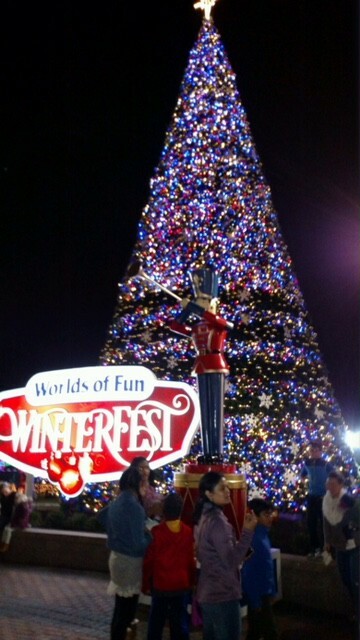 It’s the perfect backdrop for a fun photo by the tree! 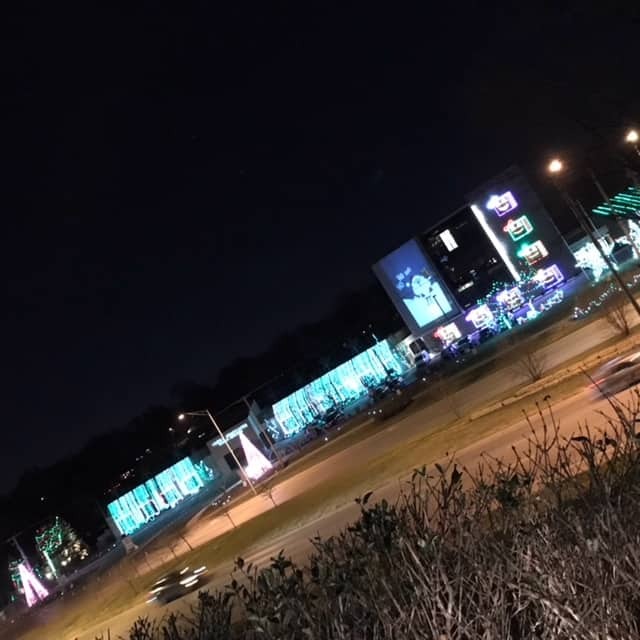 Where: i470 and View High Dr.
Lit with glowing holiday lights in an assortment of colors, the Christmas tree is a fun way to celebrate the holidays. Donations collected during the holidays go to support local families in need. Their holiday lighting ceremony is on November 21st this year. Animation, effects, and fun holiday messages are all in store for you when you visit The Ultimate Holiday Tree at Deanna Rose this year. This flat panel holiday lights “tree” is a 30-minute light display your whole family will enjoy. Tune Radio to 90.5 to listen to lights display music. The Mayor’s Christmas Tree at Crown Center is a beautiful holiday sight to see. Standing at nearly 100 feet tall, the holiday tree is the perfect spot to grab pictures for the season. Bonus – your kiddos are going to LOVE the sweet wooden playground at the base! Pop the kids in the car & check out these holiday light displays around Kansas City. You don’t even have to get the kiddos out of the car! Songs have been written about the beauty of the holiday lights at Country Club Plaza – go see with your kids! Drive through the holiday lights on all the buildings throughout The Plaza. You can see the lights now through the middle of January. Be sure to stop and shop, or eat while you’re downtown. Now through Christmas, you can see the Northern lights at Zona Rosa while you shop or dine in the outdoor shopping mall. You can also just walk around the light displays on the buildings and shops. Enjoy the free holiday light display with synchronized display music from Pleasant Valley Church. There will be lots of family fun at the holiday lights ceremony on December 1st too. Find full details online for the Hometown Holidays on the City of Liberty website. Christmas in the Park is one of the most anticipated holiday lights displays in Kansas City each year. Drive with your family through the park and take in the beautiful light show this year. This show is a very well done light display. The Vince & Associates annual holiday lights display is a fantastic display of animated lights set to fun holiday music. Check out their holiday lights page with a fun video of what you can expect! Tune radio to 96.9 FM to listen along to the holiday music. This is a full neighborhood that devotes themselves to the Christmas spirit. Nearly every single house is decorated! Plus, you can just drive right on through…you can’t miss the sign & lights decorating the entrance. Live shows, sparkling lights, tons of activities are all in store for you at Worlds of Fun this year for Winterfest. You have GOT to check out all that’s in store for you this year! 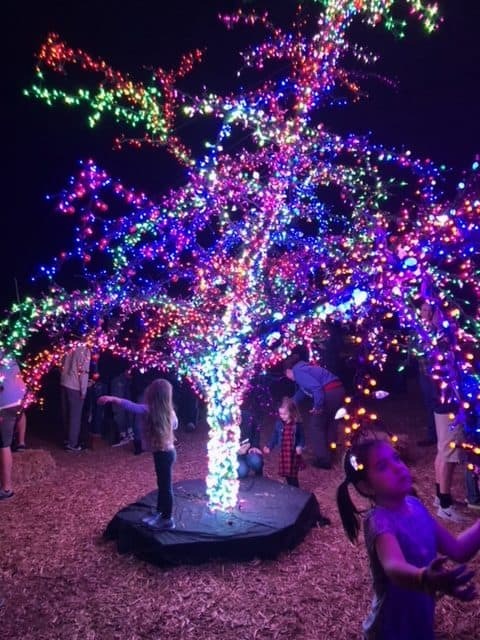 Powell Gardens combines fantastic holiday lights with beautiful botanical themes to create a fun Christmas festival of lights. You will enjoy their different holiday light shows throughout the gardens. Explore over 2 miles of holiday light displays on candlelit paths. Your family will love the Holiday Luminary Walk at the Overland Park Arboretum this year. You can enjoy special music, wagon rides, and a visit with Santa at the Depot. Enjoy a hike down a beautiful woodland path lit by torches at the Winter Solstice celebration. Bring your cameras for photo shoots by the ice sleigh and enjoy the winter evening. 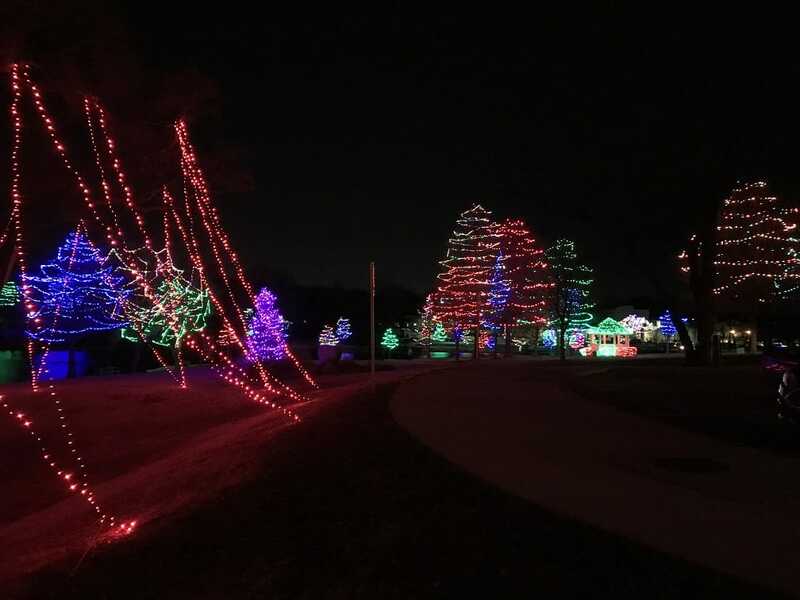 Lenexa’s Sar-Ko-Par park offers a dazzling holiday lights display each season with fun lights around the Rose Pond. The Sar-Ko Aglow holiday lighting ceremony and event starts at 6pm on November 30th. Check out the holiday lights Monday to Thursday each week. There is a stagecoach theme throughout the display. 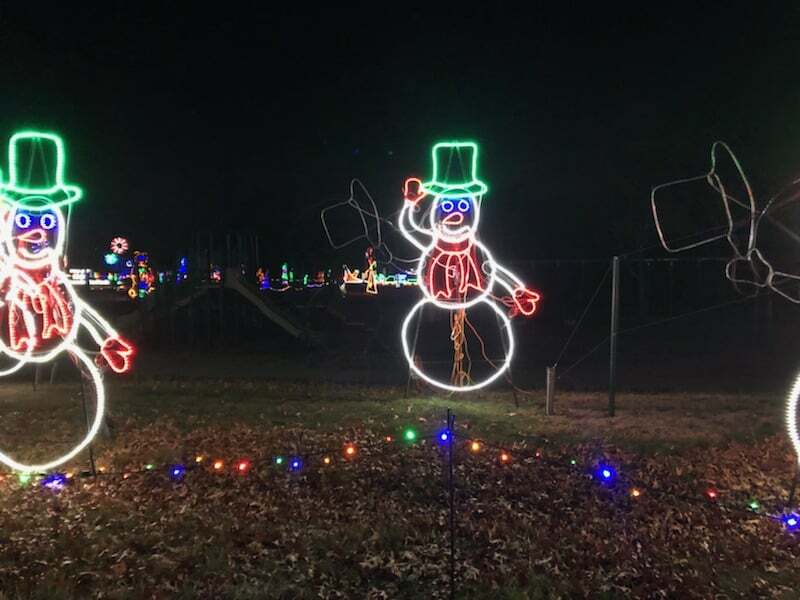 This is a wonderful drive through display that’s open nightly between now and New Year’s Eve. Each night a different charity volunteers at the beginning of the Lane collecting free will donations. There is a suggested donation of $5 per car, but not required. 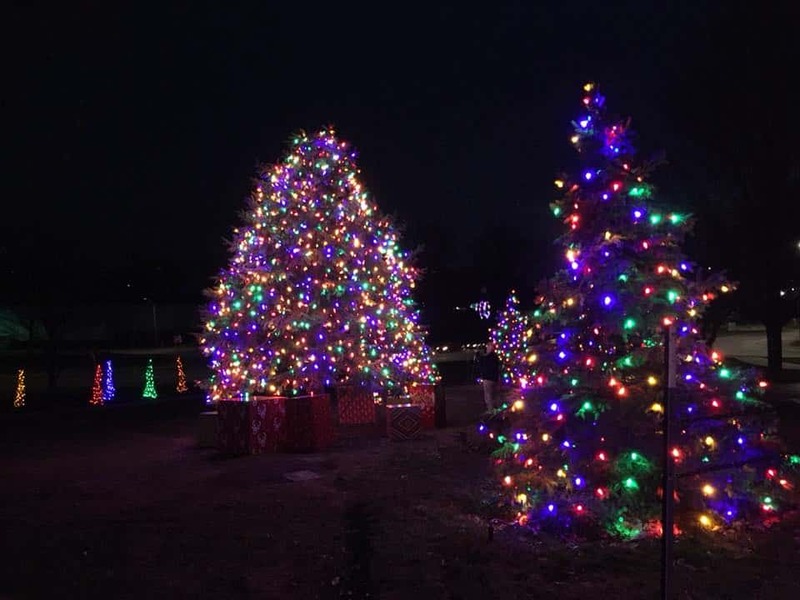 You can also ride the Holly Jolly Trolley tour on a family-friendly adventure around Excelsior Springs to see all of the best lights around town, then through the Lane of Lights. Tickets for that are only $10 per person and kids 3 and under are free. Learn more about the Lane of Lights online! The holiday lights display at Union Station are an absolute must see this season. 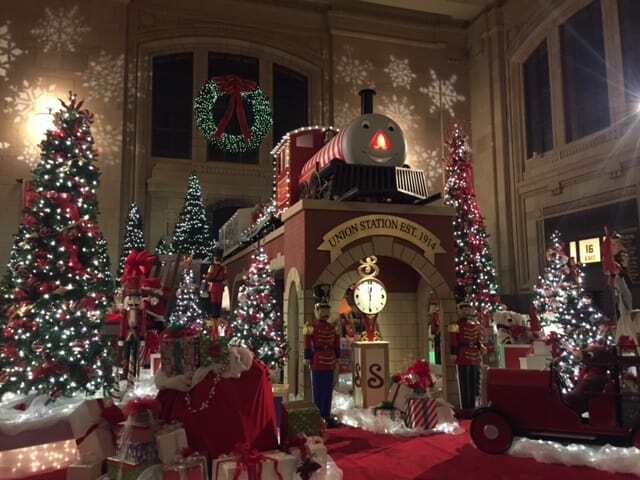 From the expansive model train exhibit to the breathtaking holiday displays all around the building – the holidays truly come alive at this historic KC light display. Don’t miss out on Union Station’s EXCITING Holiday Activities going on all throughout the season! Nov 17 Kick Off Ceremony beginning at 10 AM. Special performances! They are renting a holiday bus this year to tour the holiday lights in Kansas City! Check out the beautiful and unique Christmas lights in the traveling Christmas Party. There will be hot coffee, cocoa, and cookies! Children under 18 must be accompanied by a parent or guardian. Most register by December 11th. The entire tour & holiday bus reservation are only $20 per person. As a reminder, these holiday light locations are ones that had great Christmas light displays in the past. We do our best to ensure the details included in the map are the most up to date. If you see that we’re missing a light display, please let us know! Also, let us know if addresses on here are not doing their light display this year. You can find photos of each address at KansasTravel! 6231 Millbrook Avenue, Shawnee, Kansas 66218 – one of the best light displays! Tune Radio to 101.7 FM. 2708 N Liberty St, Independence, MO 64050 – check out their Facebook page here! You will also get exclusive invites to Kids Club events, movie premieres, & other family activities. If you’re looking for even more holiday lights, check out the Christmas Light Finder! From iFamily to Yours, Happy Holidays! Previous story Check Out this List of Holiday Movies by Age Group!